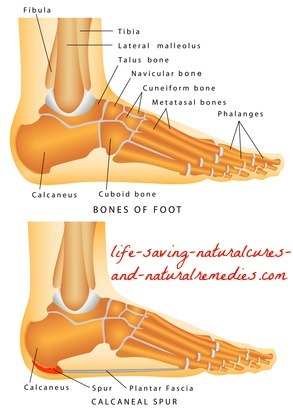 10 Sure-Fire Ways to Get Rid of Bone Spurs Naturally at Home! Bone spurs (also called osteophytes) are nasty little "growths" that occur on or near the joints or joint margin. The most common place for a bone spur to develop is on the heal of the foot, however, the spine, hands, shoulders and knees are also areas that can be affected. Localized inflammation from degenerative arthritis, tendinitis or a condition known as plantar fasciitis (inflammation of the tissues that run from the ball of the foot to the heal) are the main instigators of bone spurs. Lopsided/abnormal walking, running and jumping on hard surfaces, and being overweight are also high risk factors that can cause a bone spur. Funnily enough, bone spurs don’t always produce symptoms. Many people are in fact unaware (for many years in some cases) that they have a bone spur or have one developing. When these growths do produce symptoms, the symptoms and severity will depend on where they’re located. If the spur begins to irritate nerves, tendons, skin and fat pads then localized pain, numbness and tenderness will be felt. Spurs that develop on the spinal vertebrae can pinch adjacent nerves and cause severe pain, numbness and tingling, along with causing weakness in the area of the body that particular nerve goes to and supplies. Thankfully, treating and getting rid of bone spurs permanently is an easy thing to do when using natural and home remedies (yes, it really is). What you must do is treat both the symptoms and the underlying cause. This is the only way you'll relieve the pain and inflammation and get rid of your bone spur for good. 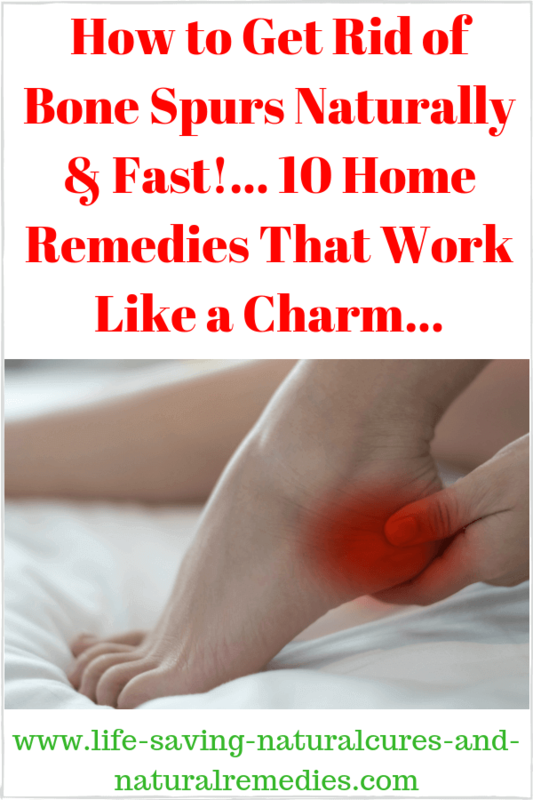 That's what these 10 home remedies will do. Many people also confuse bone spurs with plantar fasciitis (it's easy to do) and are not sure which one they actually have or are suffering from? It doesn’t matter in any case. Regardless of which one you have (or even if you have both), these natural treatments will get rid of both fully in no time. All you need to do is follow the recommendations listed below to-the-letter so you get the most out of them. The main reason you have a bone spur is your body is severely lacking calcium, magnesium, boron and vitamin D. When you get your levels of these four key nutrients back up to where they should be, bone spurs will be a thing of the past. Why? Because calcium, magnesium, boron and vitamin D are 100% essential for strong bones AND strong ligaments and tendons. Magnesium, boron and vitamin D also regulate calcium distribution within the body (bone spurs are simply "calcium deposits" that grow on the ends of the bones). Degenerative arthritis, tendinitis and plantar fasciitis can all be treated and successfully reversed if you take in the right forms of these nutrients as well. Because there are no longer enough of these crucial nutrients in our food supply today (this has been overwhelmingly proven, by the way) - supplementation is essential. The best and most absorbable way is by taking a good quality coral calcium supplement every day. Coral calcium contains calcium and magnesium at the perfect ratio (2:1), along with other minerals and trace elements that are critical for the absorption of these two key minerals. This coral calcium supplement in particular contains all of the nutrients your bones and tendons need, including added vitamin D, boron, and vitamins C & E, along with vitamin B5, which is crucial for proper nerve function and for accelerating the bone/tendon healing process (celebrity doctor, Dr Josh Axe recommends this nutrient for all bone spur sufferers)... Barefoot Coral Calcium Complete. The great thing about this supplement is everything’s included, so it's extremely cost effective. And of course, it works a treat for bone spurs! While the above treatment is more of a long term and permanent fix for bone spurs and heal spurs, the ACV remedy is a fast-acting relief remedy that begins to work in a matter of hours. Another cause of bone spurs is acid in the body. Apple cider vinegar balances your pH level to prevent acid build up. It also removes the excess calcium from your bone spur, which in turn helps speed up the healing process. In addition, ACV contains some exceptional anti-inflammatory and pain relieving properties that help to quickly soothe the soreness and tenderness. There are two ways to use the apple cider vinegar... The first is to drink it every day. Simply mix a tablespoon (15 ml's) of raw organic ACV liquid with the "mother" (like these ones) in a glass of warm filtered water. Add a teaspoon of unsulphured black strap molasses for extra benefit and taste (BSM also helps dissolve bone spurs), then drink down. Take this concoction twice daily on an empty stomach, preferably first thing in the morning and last thing at night. The second way is to use the ACV externally. For this, either soak a paper towel, rag or some cotton balls in apple cider vinegar and place on the affected area. Leave on for a couple of hours if possible and don't wash off until showering. Alternatively, add ½ cup of ACV to a small tub filled with warm water. Soak your feet in this for 15 to 20 minutes, twice daily until your bone spur is gone. What’s really good about this remedy is you get to enjoy some welcome relief from the pain and inflammation the very first time you use it! All of these herbs and spices are super strong pain relievers and anti-inflammatories – and they work like a charm for bone spurs! Dr Andrew Weil recommends you take ginger tablets (500 mg’s three to four times daily) and turmeric capsules (400-600 mg three times a day) if you have bone spurs or heal spurs.3 You can also buy cinnamon (Ceylon cinnamon) and cayenne pepper in capsule form as well. Or, simply purchase the powdered forms of these and add them to a morning smoothie (here's a handy recipe if you're interested). Remember to always take some black pepper with your turmeric as well. Black pepper increases the absorbability of turmeric by a whopping 2000%! Your body is either acidic or alkaline at any one time. The neutral pH level for the body is 7. Anything below this is acidic and anything above this is alkaline. When your body is acidic, you’ll almost always get bone spurs and heal spurs. An acidic environment causes calcium to be sent to the main acidic areas (which is usually the areas where bone spurs develop). This process causes a build-up of calcium or calcium deposits, the result of which is the development of a small bony growth or "spur". And why exactly does the body send calcium to the acidic areas? Because calcium is highly alkaline (think of acid as fire and calcium as water) - so essentially, the body is trying to balance things back out again by doing this. Unfortunately, this produces an unwanted and nasty side effect, namely bone spurs. This is why it's so critical that you take calcium, magnesium, boron and vitamin D supplements. By doing this, your body will not be acidic and so it won’t need to leach/send the calcium from your bones to any acidic areas, because there won’t be any! Remember too that calcium leached from the bones also causes bone diseases such as arthritis, fractures/brittle bones and osteoporosis, so this is another major reason why you MUST receive enough of these four key nutrients every day. Apple cider vinegar is also alkaline and acts as a natural buffer to acidity due to its high potassium content (ACV is technically acidic but becomes alkaline once it enters the body). This is why it's vital that you consume this powerful health elixir every day as well. So following an alkaline diet is extremely important if you want to be free of bone spurs. Certain foods are acidic producing while others are alkaline boosting. You definitely want to avoid the acidic producing foods, and instead, start consuming more of the alkaline boosting foods. Refined foods, processed foods, junk food, alcohol and processed dairy are all highly acidic. Raw foods, particularly fresh fruits and vegetables (this includes healthy “green” drinks and smoothies) are highly alkaline. Fermented foods such as sauerkraut, kvass, kimchi, yogurt, kefir and kombucha are also alkaline producing and contain essential good gut bacteria. Lemon or lime water is alkaline boosting as well so adding a couple of slices of these fruits to your drinking water can provide additional alkalinity. For more information on following an alkaline diet and what's involved, be sure to check out this informative article... Raw Food Diet: Benefits, Risks and How to Do It. Baking soda is highly alkaline to the body, which is why it's a reputed alternative treatment for cancer (cancer cannot survive in an alkaline environment). 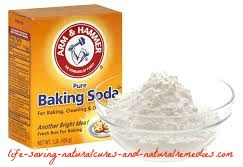 Baking soda is fantastic for giving your pH level a quick boost. In fact, having half a teaspoon (mixed in a glass of filtered water and drank) right now will put your body in an alkaline state. Once this occurs, relief from your bone spur and the subsequent pain and inflammation will begin to subside very quickly. Continue to have 1/2 a teaspoon of baking soda mixed in a glass of filtered water once daily for the next 2 weeks to thoroughly boost your pH level and help bring a speedy end to your bone spur. Baking soda works exceptionally well when it’s combined with the apple cider vinegar and black strap molasses remedy (#2) so be sure to utilize all three and consume them together if you can. In addition to this, you can also soak your feet (or area where your bone spur is located) in a small tub of warm water with a tablespoon of baking soda for extra benefit and relief. Or, mix ½ teaspoon of baking soda and a slight amount of water to make a paste. Apply this solution to your bone spur/heel spur and secure with some gauze and duct tape. Leave on for as long as possible. Epsom salt is another powerful home remedy and relief treatment for bone spurs. The crystals from the salt are made up of magnesium sulphate, and of course, magnesium is essential for healthy bones, tendons and the normalization of calcium within the body. An Epsom salt bath is great for helping to remove the excess calcium from a bone spur, along with proving relief from the pain, swelling and inflammation. Simply add 2 cups of Epsom salt to a tub of warm water and soak in this for 20 to 30 minutes. Do this 4-5 times a week for best results. Or, instead of using Epsom salts, you can purchase a transdermal magnesium spray (like this) and simply apply a few sprays to the area where your bone spur is located. This also works extremely well and definitely speeds up the time it takes to dissolve/break up a bone spur or heal spur. Fish oil contains essential omega-3 fatty acids, which are powerful anti-inflammatory and pain relieving nutrients. This oil is renowned for its ability to help with joint problems such as arthritis, but few people know that it also helps with bone spurs by actively reducing the pain, swelling and inflammation from the inside out. 4-6 of the 1000mg fish oil capsules should be taken in divided amounts throughout the day for best results. Flaxseed oil also contains important omega-3’s and can be taken with, or in place of, fish oil. 1-2 tablespoons per day is the recommended dosage. Coconut oil is another very good treatment for bone spurs - particularly heal spurs. It contains beneficial fatty acids (MCT’s) that help with the absorption of calcium, magnesium, vitamin D and boron. Coconut oil also contains natural moisturizing and healing agents, so it helps to soften bone spurs and in turn relieve the pain and inflammation. To get the most benefit out of coconut oil, make sure you take it internally AND use it externally. Consume 1-2 tablespoons orally per day (mixed in your morning smoothie is great), along with massaging some warm coconut oil into the area where your bone spur is located. Make sure you only use organic virgin coconut oil though. Do not use or consume refined (processed) coconut oils as these contain hydrogenated oils and will actually make your condition worse. Here’s what you should be looking for… Natural Organic Virgin Coconut Oil. Natural borax powder is 99% sodium borate (boron). As you now know from remedy #1, boron is crucial for the absorption and utilization of calcium. Boron is also alkaline, so not only does it help to build up and keep the calcium in your bones, it prevents acid build up so you don’t get bone spurs (or kidney stones or gout, but that’s another discussion). When you consume borax (boron) internally and use it externally on your bone spur, it will disappear very quickly. And yes, I can hear you saying “but isn’t borax a detergent”? It’s used for this purpose yes, but as I said, pure borax is 99% sodium borate – a natural mineral salt that forms from the evaporation of saline lakes. It’s perfectly natural, perfectly safe and perfectly good for you! Mix up 5-6 grams, roughly one rounded teaspoon, of 100% pure grade borax (such as this) and 5 grams of Himalayan pink rock salt (pink crystal salt contains essential trace minerals that help with absorption) in one liter of clean filtered water. THIS NOW BECOMES YOUR CONCENTRATED SOLUTION. Store this bottle in your pantry for safe keeping. Take 5 ml's of this concentrated solution, mixed in a glass of clean filtered water, morning and night (10 ml's daily). So for clarification, the one liter concentrated solution should last you 100 days before you need to make up a new batch if you're taking it correctly. Once again, the borax/pink rock salt mix should be taken indefinitely (for the rest of your life) to keep those bone spurs away forever. For external use, add 1 teaspoon of borax powder to a tub or foot spa filled with 8 cups of warm water. Stir until thoroughly dissolved then soak your feet in this solution for 20 to 30 minutes. Continue to do this daily, or at least every second day, for the next few weeks before bedtime to help break up and dissolve your heal spur. For more information on borax and why it’s so critical for bone health (and for curing arthritis, osteoporosis, bone spurs, gout, and a whole host of other diseases), be sure to have a read of this amazing article… The Borax Conspiracy – How the Arthritis Cure Has Been Stopped. It’s well worth the read! Doing some regular, moderate exercise is a great way to increase joint mobility and reduce the symptoms of bone spurs. Doing specific exercises that strengthen your plantar fascia (the ligament that connects your heal bone to your toes) if you have a heal spur or are suffering from plantar fasciitis is extremely effective. Calf stretches combined with plantar fascia stretches 2-3 times throughout the day are best. Just remember to be gentle and start out slowly – do not overstretch. Over time you will be able to increase the stretch, which will then increase the strength and elasticity of your plantar fascia. Gentle foot rotation exercises are also handy. Do these whenever you can fit them in throughout your day. 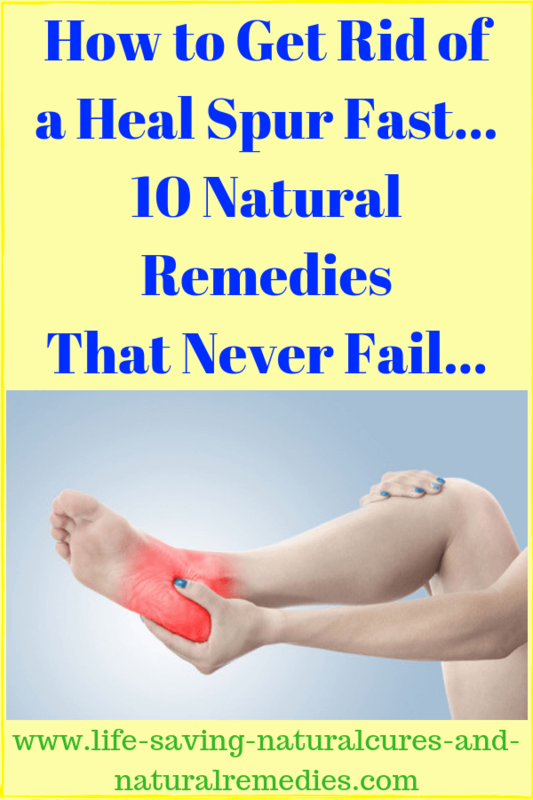 So there you have it - the top 10 home remedies for healing bone spurs. There are of course other natural remedies and treatments for bone spurs, but we’ve found that most of them don’t work all that good. ALL of the recommendations listed above work extremely well, especially when combined together. Remember this… a holistic approach to healing a bone spur is what’s required rather than the “magic bullet” approach. By this we mean you need to use multiple remedies if you want to heal that bone spur quickly AND prevent others from forming in the future, rather than looking for that one magic treatment. That’s what the above 10 remedies will do when used in combination with each other. Get going and heal that awful bone spur starting right now! The sooner you do, the sooner you can get back to enjoying your life again!